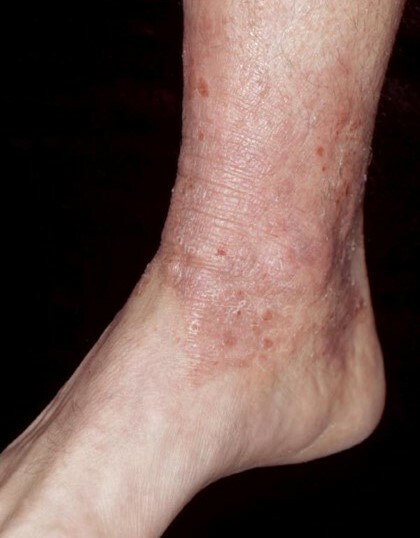 Have you noticed areas of red, dry, itchy skin on your ankles recently? You may have eczema otherwise referred to as dermatitis. Eczema is a common skin condition that can affect both children and adults. Although it is not fully understood yet what causes eczema we do understand that it usually runs in families, and that many individuals who have the condition also suffer from allergic reactions themselves such as those with hay fever and asthma. Having eczema means that the skin barrier is damaged, Individuals who have eczema find it difficult to keep the moisture in their skin making the skin more susceptible to irritants and allergens, thus the skin becomes dry and easily irritable. This causes chemicals to be released, which worsens the irritation and makes the individual want to scratch the area, but scratching will only make the skin more irritable, thus the sequence repeats making for a very frustrating experience to deal with. If you suffer from the symptoms mentioned then you may have eczema. If you have any concerns come visit one of the many knowledgeable podiatrists at PodiatryHQ for a full examination today. Why Won’t This Wart Go Away?